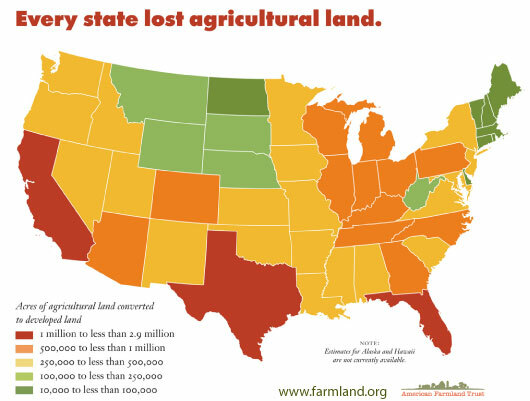 Data from the U.S. Department of Agriculture’s 2007 National Resources Inventory story of our nation’s farm and ranch land loss in numbers. The 2007 National Resource Inventory is the most comprehensive natural resource database in the United States—tracking conditions and trends on non-federal land from 1982 to 2007. 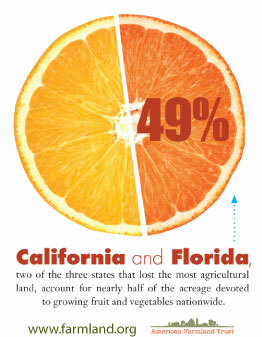 The analysis behind these graphics was conducted by our Farmland Information Center (FIC) and first appeared in our Winter 2010 issue of American Farmland magazine. 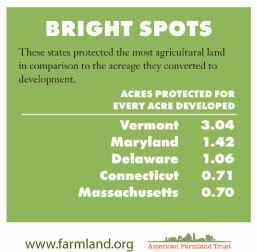 Stay tuned as we release more information on farmland loss across the nation. Want to do something about it? Send a letter to your state lawmakers today and tell them to protect the precious farm and ranch land in your state! Feel free to re-post these images, but please link back to us. This entry was posted in Farmland Protection, Local Farms and Food and tagged agricultural land, Arizona, California, farmland loss, Florida, National Resource Inventory, North Carolina, Texas on December 22, 2010 by admin.